UFC lightweight champion Khabib Nurmagomedov thinks Tony Ferguson will have a tough time against Anthony Pettis at UFC 229, but he's hoping he will win. 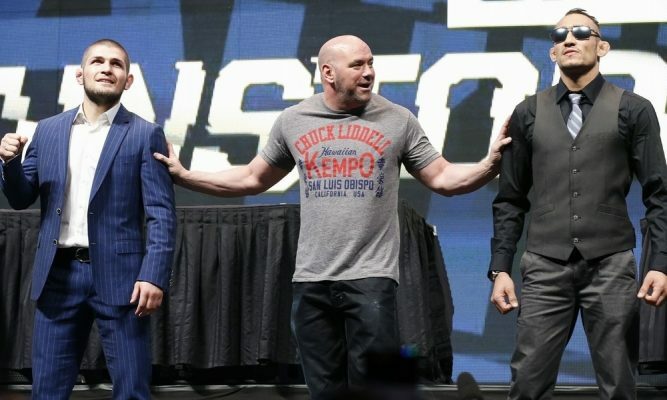 UFC lightweight champion Khabib Nurmagomedov and Tony Ferguson have perhaps one of the longest and most storied feuds in the UFC without ever fighting and the mind games don’t appear to be over. Of course, time heals all wounds and with Ferguson never officially losing his interim UFC lightweight title after being stripped of it at UFC 223, a showdown between the two of them could be on the cards should both men be victorious at UFC 229 in three weeks time. Despite the stop-start-stop nature of their feud in the past, speaking recently with Brian Vaga (@IamtheBay), Nurmagomedov said he would happily fight Ferguson in 2019 should he overcome Anthony Pettis in his return fight on October 6. “I hope he going to win,” Nurmagomedov said. “But my opinion, this fight is stylistically little bit bad matchup for Tony Ferguson. I don’t know how he feel after he is injured. He is 34 years old. It was revealed earlier today that Ferguson vs Pettis will feature as the co-main event for UFC 229 and will be joined by Derrick Lewis vs Alexander Volkov, Ovince St. Preux vs Dominick Reyes and Michelle Waterson vs Felice Herrig on the main card.